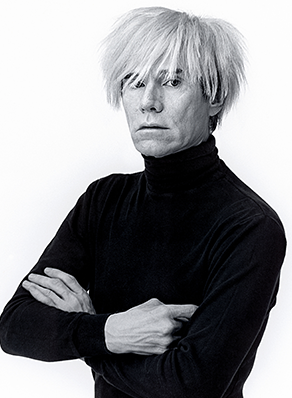 The son of Slovakian immigrants born in Pittsburgh, Pennsylvannia, on 6 August 1928, Andy Warhol pioneered a combination of avant-garde and highly commercial sensibilities that made him a founder and leading figure of Pop Art. Starting in the early 1960s, his work explored the relationship between advertising, fame and artistic expression through media including painting, silkscreen, sculpture, film and photography. By the time of his death on 22 February 1987, he was one of the best-known artists the world had ever seen. After graduating in Pictorial Design from the Carnegie Institute of Technology in 1949, Warhol moved to New York, where he became one of the most successful and imitated illustrators of the 1950s, with clients such as Harper’s Bazaar and Tiffany & Co. Turning to painting, he revolutionized the form conceptually and technically, producing works about mass-produced goods and celebrities – such as his now iconic 1962 Campbell Soup Cans and Marilyn Dyptich series – that used silkscreening, a process that removed evidence of the artist’s hand while allowing the repetition of an image with variations. He created hundreds of sculptures replicating supermarket products (Brillo Boxes, Kellogg’s Boxes, in 1964) as well experimental films about boredom, time and repetition (Empire in 1963; The Chelsea Girls in 1966), among many other endeavours. His international fame brought Warhol hundreds of commissions from socialites and celebrities and made parties at his silver-painted studio, The Factory, into the place to be through the 1970s. With work that simultaneously satirized and celebrated materiality and fame and a voyeuristic personality with a clear taste for money and fame, Warhol shaped many subsequent generations of artists. His works are among the collections of the Museum of Modern Art, New York; Moderna Musset, Stockholm; the San Francisco Museum of Modern Art; and many others.